Recipe 9 of my 100 Healthy Recipes Challenge: I’m beating the heat today with the 3rd in the series of my No cook Gazpacho. 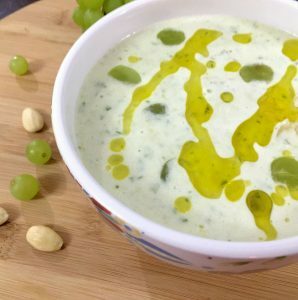 Lunch was a cucumber sandwich and a bowl of this delicious chilled white Grape and Almond Gazpacho. Quick to make, tasty and lovely to look at too. It is really impossible to cook in this weather. Bangalore is climbing dizzily to nearly 40 degrees Celsius, and there is no sign of rain or even light summer showers. Its early summer and I wonder what its going to be like in May and June when the heat is usually at its worst….